Sounds like a plan, any restrictions on where we can camp? I know the old Lion Red Furuno they used to camp on Kawau but probably had permossion, be good to get further out tho and know where we can get fuel. My suggestion would be to do Great Barrier staying on a houseboat in Fitzroy around the Smkoehouse/Forestry Bay vicinity. Houseboat has all facilities and will comfortably sleep a good crew. We would also be able to tie approx 8 - 10 skis up around the decks surrounding the house. Very sheltered area and close to some serious fishing grounds. There are refuelling facilities there as well as other general store type facilities. I would suggest an early morning departure from Leigh then the trip is relatively easy especially if it cuts up rough for the return trip home etc. Leaving from anywhere else is just too far away. There is no reason if we made a trip here that each of us didn't acheive PB Snapper and Kingfish etc !! I am awaiting a reply from the houseboat people to confirm avaiability over the next couple of months so a trip can be planned if there is enough interest from you all ............I feel another Tui billboard coming on for this one !! Hi Guys, my 2 cents worth would be we consider two over nighters in the near future. Secondly regarding the Barrier can I suggest if we were to do a couple of days over there that we take the car ferry from Auckland, we could get a deal for a group. The reason for this is that you are pretty much guaranteed to get back on the car ferry, the last group i heard of going over the the barrier on skis just for an overnight had a very very rough trip back despite being a good forecast. Fuel, although available on the barrier is only open at particular times of the day and also they do run out, secondly it is naturally much more expensive than Auckland prices. we could carry our own fuel in the vehicles. also even if the weather is not fantastic we can shift our launch locations according the the weather and sea conditions. Any more thought from anyone? Well I am totally with Swasy on this one, however have just dome some 'research', and the cheapest price the ferry does from Auckland to Barrier seems to be around $350 return for the car, with the trailer and probably passanger fees in addition... I have tried to call them but no luck so far... will try again in the morning. Not really sure if my budget would stretch that far... would rather have some over-nighters more local for my money... I am keen, but naturally the wallet only stretches so far! I'll let you guys get there how you like but as far as I am concenred riding there and back will be half the FUN !! Now we are talking, if im gonna go to the barrier then I might as well have a decent crack at it. I like swazy's idea too so maybe a smaller local one first. You might need to invest in that trailer sooner Fishoe! Ive camped out in Bryants Bay just inside scully's before, good wee spot, not too far to go either. The Barrier comes into it's own from April through to late November. So in my opinion the most worthwhile trip for XOS fish would be April/May and usually this is when the glass calm crisp days are common. This would certainly allow plenty of planning etc.... Leigh is the best place to lauch with Little Barrier being a half way point along with the infamous Horn Rock area that I pulled my last succession of 18lb + fish from years ago in a boat. Fitzroy Harbour is unbeliveably sheltered and quite stunning really and is in close vacinity to wicked fishing grounds. Safety of course would be paramount, so we would have to decide required equipment to come on the trip. I would also plan to liase with a well known charter operator in the area just in case assistance of a large boat is required, I doubt it would be but it is better to plan and not need it, than need it and not have it. Planning is essential and the ride over would be awesome and not take that long. From Leigh I think it would be around an hours ride directly. Some can go car ferry if they wish, but I am guessing the majority will ride for the fun and excitement and also the cost. We would need to plan 2 dates to allow changes due to weather conditions. Fuel at this time of year it usually not a problem like it can be over the summer holiday months and store is open 5 - 6 days at this time. The houseboat option is fantastic and provides some relaxing luxuries at the end of each day. I certainly think an Inner Gulf overnighter at the bottom end of Waiheke or one of the Coromandel Islands etc would be great to organise over the next month or so and just sleep in tents or under the stars. April/May gives ample time to plan and save. This could be the first annual Jetskifishing membership comp? open to registered users only, surely we could drum up a few prizes etc? Will try not to get to excited, last time that happened (last weekends Kingi hunt), well, say no more aye extreme! For the record "I will not accept any responsibility for others catching fish, as clearly I cannot lead by example and would be better off fishing in my fish tank at home or driving my jetski to Ocean Mart, buy some snapper and put them in my chillibin".....unfortunately for all the sheer addiction to JETSKIFISHING (not JETSKICATCHING) is far too much fun to ignore. Them fellas are mean buggas aye Mark?? 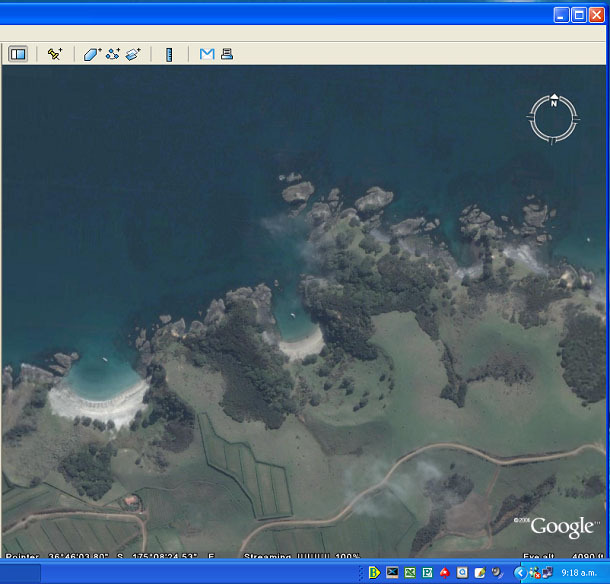 I would suggest making camp at Garden Cove on the Northern side of Waiheke down towards the Gannet end. Ganeet is only 5 mins away and the surrounding area and Spray Rock is about a 30 sec ride straight out from the cove. It is a stunning little bay that can only fit maybe 4 large boats so it is very sheltered and perfect for the skis. Entrance to the cove can be dangerous if you are not aware as there is a large rocky area in the middle but if you stay to the west side of the bay(narrower side) all will be sweet. The only wind the effects the cove is a northerly so it is usually very calm. The beach and bottom is sand so if a ski ended up on the dry little damage would occur compared to most of the beaches around the eastern end that are mainly stone/rock beaches. Garden cove is the small beach in the centre of the image below. I'm keen when are we doing it? by the way is that a private beach or public? Not sure.... I know a few yachts and launchs that moor in there if there are no other boats. How do we find out? I doubt is is private as there are no properties/houses near by but I suppose we should check. What are the rules with open fires on the beach as well...??? Fires might be a problem this time of year, as for it being private, sometimes it is easier to seek forgiveness after the fact. Done the homework and can confirm that it is a public beach that anyone can use/access. Boat/ski access only as there is no road access and due to it's remoteness and access is generally quiet.